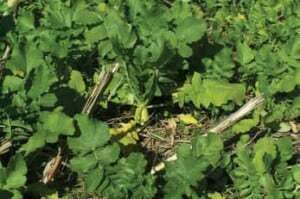 Eco-Till Radish is a new Daikon type forage radish variety specifically developed for fall/winter cover crop applications. These radishes offer impressive benefits to the soil and the environment including the reduction of soil compaction, improved nutrient recycling, increased organic matter, enhancement of soil tilth and suppression of weeds, to name a few. A superior, deep penetrating taproot is one characteristic that separates Eco-Till radishes from the competition. The thin, lower portion of the taproot can grow to a depth of six feet or more while the thick upper portion of the taproot can grow to a length of 24 inches. This taproot creates vertical holes in the soil profile that breaks up soil compaction and improves soil tilth. This process, known as “bio-drilling”, improves water infiltration, aeration and fertilizer efficiency for succeeding crops. Equally important is the ability of these radishes to take up nutrients from the soil profile to be stored in the tissues near the soil surface and make them readily available for use by the following crop. Planting Rate: Conventional or No-Till Drill: 8-10 lbs/Acre. Broadcast: 12-15 lbs/Acre (broadcast seed needs a light disking or rolling with a corrugated roller to ensure proper seed to soil contact). Planting Date: North of Interstate 80- Late July to August 15. Between Interstate 40 & Interstate 80 – Late July to September 15. Fertility: Apply as directed by soil test. Nitrogen deficiency will limit overall growth, the ability to compete with weeds and root penetration through compacted soils.